Here is another mental strategy that has to do with the way we speak. Positive communication is important. The word “yet” is one of the most powerful words you can add to your vocabulary. So many people get discouraged too easily when things don’t work out right away. We have to teach our children and the people around us that there is a lot of power in the word “yet”. This little word changes a sentence, and it certainly change the way how we can feel about something. If someone asks you a question, you can also answer with “not yet”. Have you found a solution to this problem? Not yet but I will. Can you see how powerful this response would be? This is a mentally affirmative statement because you expect it to happen. Hoping for something is great but expecting it is far more powerful. 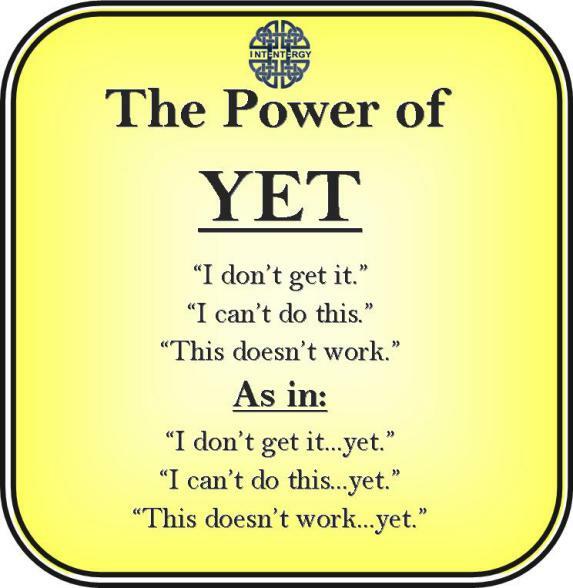 Next time you want to say “I can’t”, make sure to add the word “yet”.